Try not to take it personally: Remember it’s your ROLE that has been made redundant, not you. 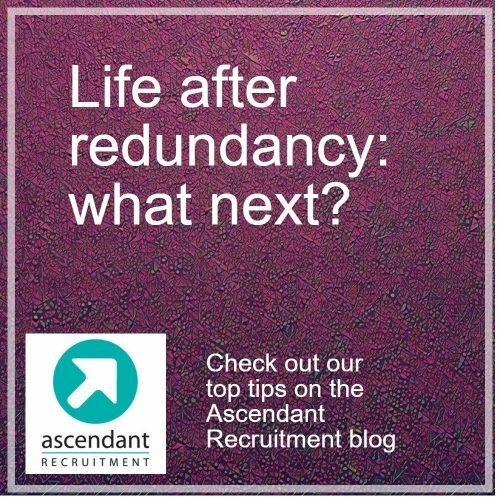 Redundancy is something that affects a lot of people at some point during their career. Typical reasons include company restructuring, office relocation, outsourcing a particular function, two companies merging or a business simply closing down. Unfortunately in the majority of cases the situation will have been out of your hands and there’s nothing you could have done to avoid it. Stay positive: With this in mind, the key to getting through any situation is to try to remain upbeat and positive. What could initially appear to be a set-back could turn out to be an opportunity to find something better and more fulfilling! It’s a good idea to consider your options and review things you liked and didn’t like about your previous job, so that you can focus on finding a role and a company that is right for you. Keep reminding yourself that it’s not a case of IF you find a job, it’s a case of WHEN you find a job! Update your CV: One of the first things you’ll need to do is to update your CV to reflect your most recent experience. You’ll find a wealth of handy CV do’s and don’ts online. We’ve also put together some blogs on the topic too – you can find them here and here. Try and target each application to the specific job you’re applying to. Make sure you highlight your most relevant skills for that particular job and any achievements you’re particularly proud of. Get references: If possible, try and get a character reference from your company before you leave. This will help highlight your skills and strengths to a potential employer. LinkedIn is also a great platform to use, not just for networking but also for asking your contacts for endorsements and recommendations. Be proactive: Take as much control as you can over your situation by being as proactive as possible. This could include reaching out to your network through social media platforms and making sure you have registered with reputable recruitment agencies who can act as an ambassador on your behalf and find new opportunities. You can also use a professional social network such as LinkedIn to start following companies of interest and connecting with key people in your industry. Tip: If you’ve registered on job board e.g. Reed and Monster etc, it’s a good idea to log in on a regular basis and not solely rely on job alerts to be sent to your inbox. Recruitment Consultants and employers will often search for prospective employees based on when they last logged in. If you want to be found, it’s a good idea to log in at least once a week! Another tip! Adding ‘Seeking new opportunities’ to your LinkedIn profile will also help prospective employers to find you! Consider temporary work: You can avoid using up all your redundancy pay by taking on temporary work while you look for something permanent. Temping is a great way of keeping money coming in as well as being an opportunity to show a prospective employer what you’re capable of. Many companies also offer temp-to perm contracts, meaning that your temp job could lead to a permanent opportunity. 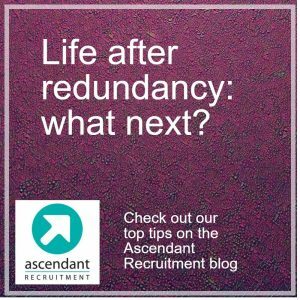 Throughout your redundancy journey, try to keep in mind that you’re not going to be right for every role and not every role is going to be right for you. If you’re unsuccessful at interview, ask for constructive feedback and use it for the next interview. By remaining proactive, focused and positive you’ll be in a great position to find yourself moving onto bigger and better things in the future. « Ascendant Recruitment – celebrating 15 years in business!